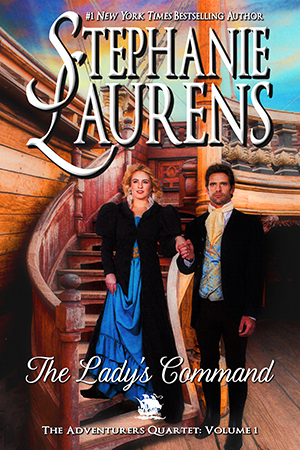 THE LADY’S COMMAND has everything that you can expect from Stephanie Laurens – adventure, danger, intrigue, a strong-willed and independent heroine and an honorable and brave hero – but it’s also a little different because in this book, the story begins after the courtship and marriage of the couple, unlike in other books where this is usually a part of the adventure. Captain Declan Frobisher knew he wanted Lady Edwina Delbraith as his wife the first time he set his eyes on her and now that he’s achieved that goal, he expects that she’ll spend her time like the other ladies of the ton – managing his household, bearing his children and pursuing other ladylike interests, while he sails the seas as part of his family’s business holdings as well as on the covert missions undertaken on behalf of the Crown. Lady Edwina has different ideas on what kind of marriage she wants and it involves being a part of every bit of her husband’s life, not just part of it. So when Declan has to go on a mission and refuses to allow her join him, she takes matters into her own hands decisively. I enjoyed this couple very much, especially their willingness to make their marriage what they wanted in spite of the expectations of society, and their journey becomes one of discovery. Edwina has the spirit of an adventurer, just like Declan and embraces life with open arms. She’s also very skilled and strategic at social niceties, which comes in handy for the Frobishers who have little skill in that area and have to rely on Edwina and her family to help them. These skills will be very handy in the information-gathering mission they are undertaking and I liked that Declan was quick to recognize and capitalize on that. The revelation that Declan and his brothers routinely undertook secret missions for the Crown highlights his loyal, daring and courageous nature and Edwina was definitely the perfect woman for him. There are some surprises too, but what stands out is that Edwina is the more forceful personality of the two of them, which is a departure from Ms. Laurens’s usual characters. I love the mystery angle of this story and anyone who loves mysteries or has read and loved her Black Cobra Quartet series will love this new series as well. Danger, secrets, missing persons and voodoo priestesses are just some of what await Declan and Edwina at the end of their journey, The clues are doled out sparingly but you’ll be waiting for the next book eagerly just for more pieces to the puzzle. This book has a slower pace than other books and the romance is more sweet than fiery but that doesn’t make it less interesting. I actually enjoyed the development of Edwina and Declan’s relationship. THE LADY’S COMMAND has its own charm and I look forward to the rest of the series. I like the fact that the couple is already married – it gives a different feel to the romance.